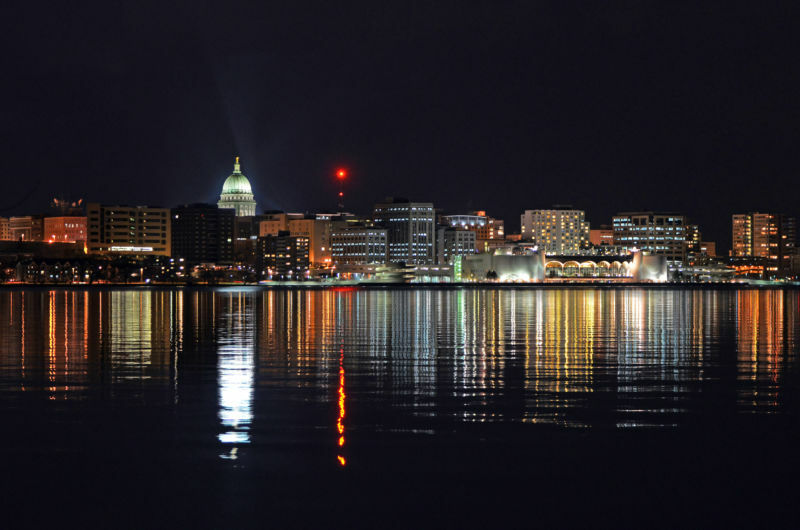 I have read many things about Madison, Wisconsin over the past few years. It has won several awards for being a great place to live, but to be honest, I never had any desire or need to go there. That is until my “niece” was moving there from Chicago for her new job as Creative Services Director and On Air Host for Life radio 102.5 WNWC. Her on air name is Summer Shepherd. She’s amazing. Of course, I am a bit biased. Can you tell? On my recent trip to Chicago we took the two-hour drive to Madison to help Summer find a new place to live and to check out her new city. Honestly, I didn’t expect to like it so much. First off Madison is clean, I mean it looks sparkly; Even in the horrible weather we had (wind, rain, snow, hail, thunder, and lightning), you could clearly see that. (I was not even able to take my phone or cell phone out for photos so I am making do with copyright free photos from the web.) Even the people looked clean-cut and nice. As Madison is Wisconsin’s state capital, I did get to see the gorgeous state capitol building. We laughed ourselves silly with visions of the movie European Vacation as we drove round and round the capitol building trying to find parking. It is in the center of not a square, but a roundabout. There are arms coming off each exit to State Street and other main thoroughfares; parking is tricky in this area. Unfortunately, as we were there on a mission, I didn’t have the opportunity to explore this piece of our nation’s history. 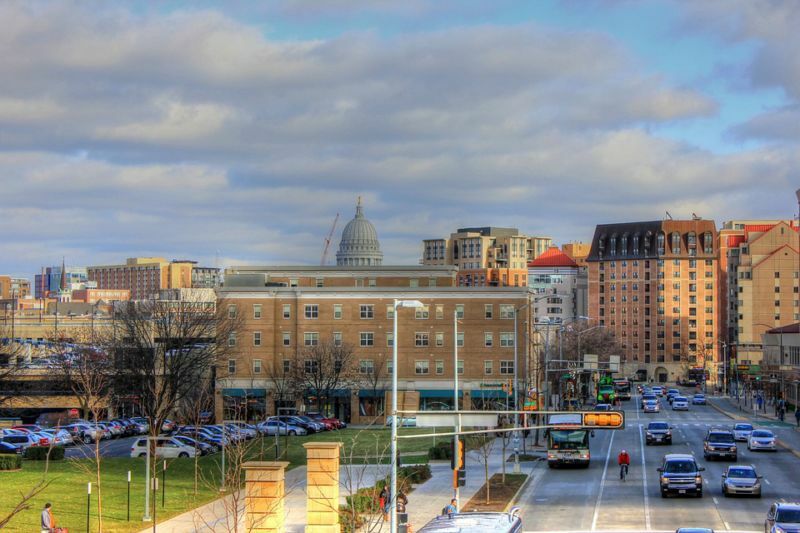 The downtown area is dominated by the University of Wisconsin campus. From what I saw from driving by, the campus is lovely. I am sure that is part of what gives Madison so much of its vibrancy. What I wasn’t expecting was for Madison to be such a hip, trendy, foodie place. There are so many great looking restaurants and bars. We didn’t have an opportunity to sample many, but what we did was great. We ate at a local pizza place off of State Street called Ian’s Pizza. You could buy fresh made salads, and pizza by the huge slice. The food was absolutely delicious. They make the pizza ahead of time and heat it up for you. The salads they make right in front of you to order. You can customize it any way you like. This place was really hopping at lunch time. The pizza was good with lots of cheese and flavorful toppings. I have to say, though, it was the salad that won me over. Maybe, because it was made with all the fresh ingredients I selected? Was it the most exciting or amazing pizza I have ever eaten? No, but it is great for what it is, and certainly better than Pizza Hut or any similar chain pizzeria. Also on State Street was Vom Fass. It is a gourmet food and alcohol place. It looked amazing. I was drooling at the things they had in there. Unfortunately, I didn’t have proper time to shop there (my credit card was relieved). I would highly recommend you go in and have a look. Shopping and eating on State Street is what people do. There were plenty of choices and some ethnic tastes, but for the most part it seemed a trendy spot where people like to hang out and be seen. There are also theaters and museums in the area. The thing I loved was that it was all so accessible. The city seems bite-size; where nothing is too much hassle or too far away. The other thing is the gorgeous water views of Lakes Mendota and Monoa that flank the city. As you drive up to the city it almost looks like it’s a moat surrounding the place. 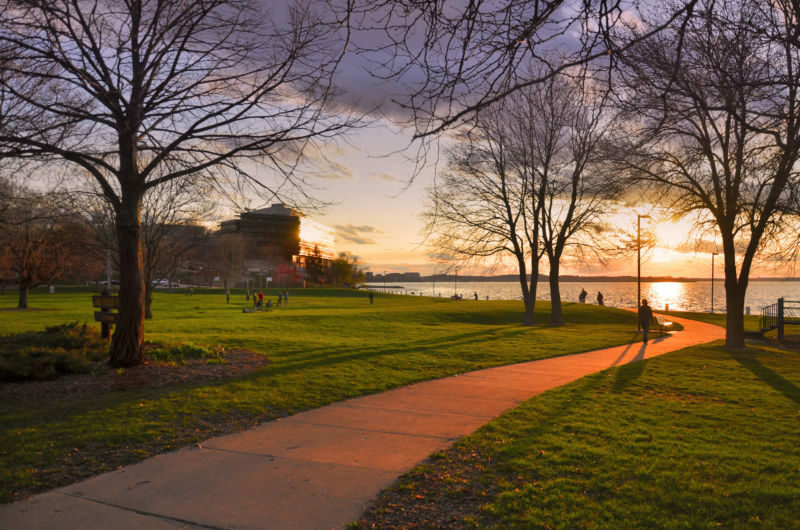 There are bike trails and parks all along the water front and I could imagine how stunning it would be to hang out there on a beautiful day. It’s a perfect picnic and kite type of place. You get that wholesome vibe just looking at it; even in horrible weather. Summer did find a wonderful place for her little family. It’s in the suburbs right outside the city. She’s close to a little beach area called Spring Harbor Beach where she takes her adorable baby to play. They can walk there from their new home. The price of her 3 bedroom townhouse was not much more than what my niece in California pays for her tiny studio. I can see why people love it there. I will have to visit in spring or fall when the weather is better. Winter is way too cold; summer too hot and humid. What can I say? I am a fair weather Auntie. 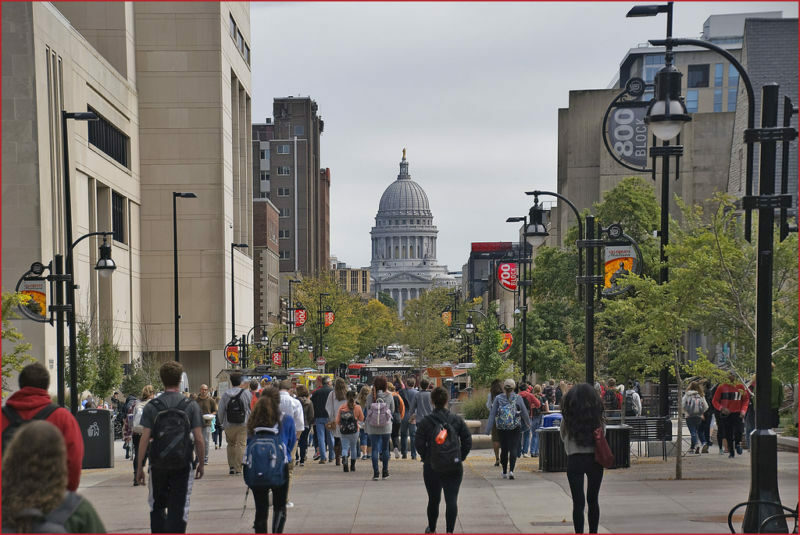 I hadn’t planned to write an article about Madison, but I was so impressed and I had more to say than I thought would be the case. I have heard that there are winemakers in the area, but as I said, I didn’t have time to try any out. Next time!